At this 1716 inn, it is said that a woman named Jerusha Howe lingers, especially in Rooms 7 and 9. She is said to have been unlucky in her love life, and therefore likes to touch male visitors. 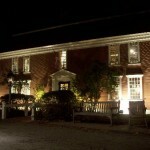 Author Henry W. Longfellow wrote a book about the inn in the 1860s, Tales of a Wayside Inn. 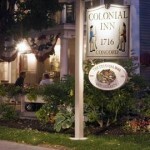 My wife and I stayed at this Inn in Oct. of 1988 and Oct. of 2008. The first visit was very pleasant as well as the second but our last time there, something happened. Now keep in mind, neither my wife or I have ever believed in such paranormal activity, my wife is extremely religious so really, she refuses to believe in such things. But after this last trip to the Inn, she now realizes that their our “spirits” around us. We were checking out of the Inn that last day of our trip, we went down to the lobby, talked a few minutes with the Inn Keeper, and I noticed my wife acting differently. She wasn’t her normal “talkative” self. After we got in the car, she asked if I smelled that over powering woman’s orange perfume. I had no idea what she was talking about. She said there, at the checkout counter, the overpowering citrus perfume smell, it gave her an instant headache. I had no idea what she was talking about. After we got home, I started to do some research on the net, about the Inn, came across the story of Jerusha Howe. Both of us got chills down our spines. Another interesting fact about this place is it was once the residence of Henry Ford .My wife and I recently had lunch here and ate in what was once Mr. Fords bedroom and private quarters ……. Awesome place for anyone looking to take in some history , great views , and an even better meal!